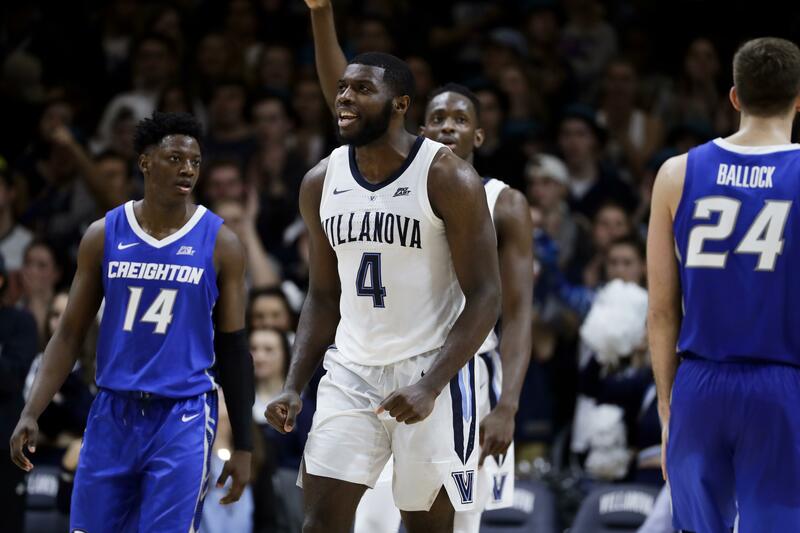 Wed., Feb. 6, 2019, 9:42 p.m.
VILLANOVA, Pa. – Freshman forward Saddiq Bey scored a career-high 17 points, senior guard Phil Booth hit key baskets down the stretch and No. 14 Villanova remained perfect in Big East play by beating Creighton 66-59 in overtime Wednesday night. FORT COLLINS, Colo. – Jordan Caroline scored 30 of his season-high 40 points in the first half and Nevada beat Colorado State for its eighth straight win. Caroline finished five points shy of his career best set Jan. 7, 2017, at New Mexico. He added 12 rebounds for his 14th double-double of the season, and his 41 career double-doubles are the most in Mountain West Conference history, breaking a tie with Kawhi Leonard and Andrew Bogut. MINNEAPOLIS – Ethan Happ had 15 points and 13 rebounds to help Wisconsin avenge a loss to Minnesota with its sixth straight win overall. D’Mitrik Trice hit a 3-pointer with 1:44 remaining and 3 seconds left on the shot clock to give Wisconsin (17-6, 9-3 Big Ten) a 52-46 lead and seal a fourth consecutive victory at rival Minnesota. Gophers coach Richard Pitino fell to 2-9 in his career against the Badgers, held to a season-low 34.5 field goal percentage (19 for 55). STARKVILLE, Miss. – Freshman forward Naz Reid tied a career high with 29 points, including a 3-pointer with 15 seconds left, to lift LSU over Mississippi State in overtime. LINCOLN, Neb. – Jalen Smith had 18 points and 11 rebounds as Maryland beat fading Nebraska. Bruno Fernando had his sixth consecutive double-double, and 15th of the season, with 13 points and a career-high 19 rebounds for the Terrapins (18-6, 9-4 Big Ten). Isaiah Roby led the Cornhuskers with 20 points and 14 rebounds. Published: Feb. 6, 2019, 9:42 p.m.